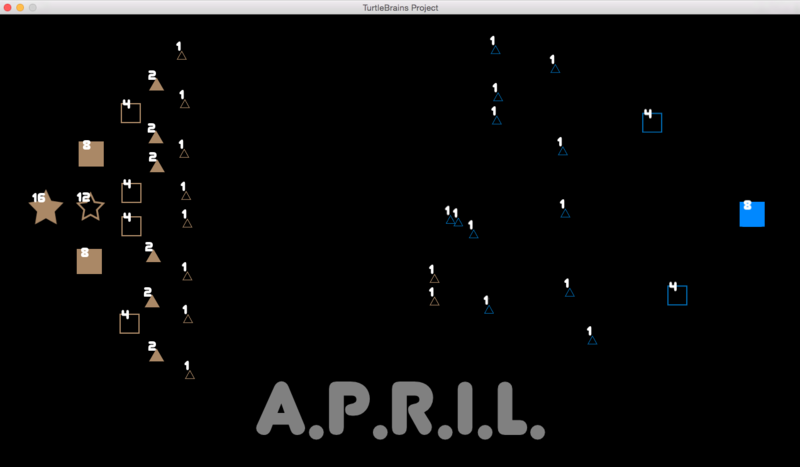 This screenshot doesn’t show the action of attacking and defending units, but in the last few days I’ve been leading a small team on a collaborative project: APRIL. The project is essentially a small real-time strategy game where a unit is composed of tiny little nanobots. You can order units to combine to become bigger and more powerful, and order them to move around. Here is an animated gif of the interactivity as it was a few days ago, you can already see differences in that screenshot. The scope of the project was kept as small as possible so we could get the mechanics complete and focus on polish and design. I was tasked with getting the project started and the first interactivity build complete, from that point on my gears have changed to adding a TileMap, Camera and SoundManager to TurtleBrains. This project has been using a wide spread features of TurtleBrains, showing any lacking areas. There are a few and notes have been created which I will be addressing. Some have already been addressed, so the framework is constantly improving. This entry was posted on Thursday, April 9th, 2015 at 3:53 am and is filed under OneGameAMonth, TurtleBrains. You can follow any responses to this entry through the RSS 2.0 feed. Both comments and pings are currently closed.